The innovative & powerful KT 300 Watt Portable Solar Blanket is ideal for 4WD, Camping & Recreational Outdoor Activities. Included with this kit, is a PWM 20Amp Solar Charge Regulator (IP65 Rated), Suitable for charging WET, Calcium, LifeP04 (Lithium Iron Phosphate), LTO (Lithium Titanium Oxide), Gel & AGM Batteries. Power Leads and Accessories included for easy connection to batteries & devices. Designed as a convenient, light-weight, space-saving solar solution, the KT 300 Watt Solar Blanket features 3 x 5 (15 total) Monocrystalline Solar Cells which fold neatly into an easily transportable 390mm x 380mm x 140mm carry bag and weighing in at a light 8.85Kg. 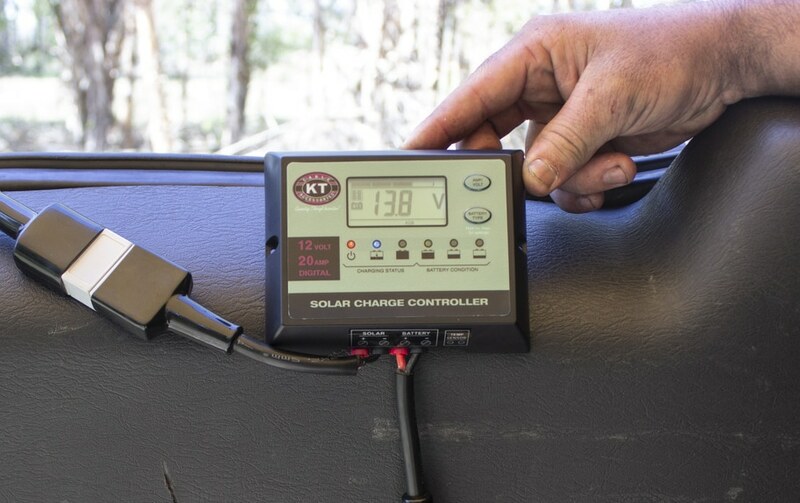 Manufactured with a scratch-resistant matte coating for extra durability in Australian off-road conditions, The KT 300 Watt Solar Blanket features an innovative anti-theft tab which can be locked into the door of a vehicle, for peace of mind. The easy mounting loops allow the blanket to be mounted in various positions for ultimate solar harvest. Designed to charge LifePO4, LTO (Lithium Titanium Oxide), Gel, AGM, Conventional Lead-Acid (WET) and Calcium Batteries. KT Solar Blanket features a built-in regulator to prevent your battery from being overcharged. Over-charging occurs when the charge voltage is unregulated. This can result in premature battery failure. The regulator prevents your battery from being undercharged. In the solar energy field, battery undercharge always occurs, especially on some conventional Lead-Acid or Calcium batteries. Advanced MCU control Pulse Width Modulated (PWM) technology, high-efficiency operation. Suitable for LiFePO4, LTO (Lithium Titanium Oxide), Gel, AGM, Conventional Lead-Acid (WET) and Calcium Batteries. The unit provides an automatic equalisation feature for deeply drained conventional Lead-Acid or Calcium batteries, as well as providing a cycling automatic equalising feature every 28 days. Can be connected to the battery permanently to keep the battery fully charged using a process called ‘floating’. This means that the controller will stop charging when the battery is full and will automatically start charging the battery as required. This process will also reduce water loss and help prevent the battery from ‘drying out’. Protects your battery from discharge at night. Under low light or no light conditions, the Solar Panel voltage could be less than the battery voltage. The unit contains a special circuit which prevents current flowing back from the battery and into the solar panel. Coloured LED’s to indicate the operational status and battery conditions. Digital LCD to directly display battery voltage, charging current, charging capacity (Amp-Hour), battery types, full charge and fault codes. Multi-charging protections against reverse polarity, short circuit, over temperature, over voltage, etc. It is recommended not to place your Solar Blanket over vehicle paint-work. Humidity can cause the blanket to stick to paint-work. Solar Blankets are unlike tempered glass folding kits. They have a thick canvas material stitched in behind the solar cells. Your KT Solar Blanket should be folded up and stored in a dry place at night whilst camping. Try to avoid placing on wet grass during early morning sunlight and select a dry surface for the blanket to be placed. Unless suspending or for windscreen application. Do you have a question? or a business inquiring to purchase bulk, or stock this product?